A grieving mother attempts to contact her dead son. 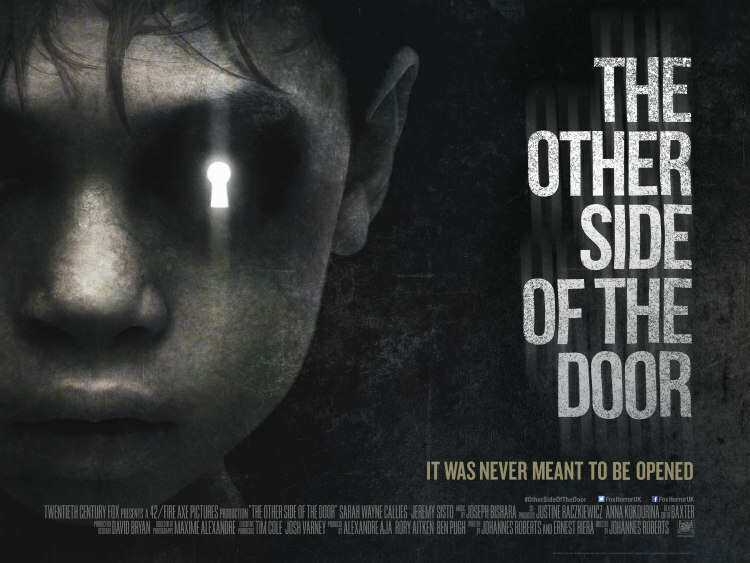 Made with no apparent love or understanding of the horror genre, The Other Side of the Door may well be the worst example of its kind so far. This is mainstream studio horror at its lowest ebb - lazy, derivative, inept and xenophobic. The past year has delivered many treats for horror fans. Movies like It Follows and The Witch have pushed the boundaries of the genre, winning over the arthouse crowd if not the mainstream public, while Unfriended and M Night Shyamalan's triumphant comeback The Visit managed to pull off the seemingly impossible task of injecting new life into the found footage format. Yet for every It Follows there's a handful of The Forests, for every The Witch a slew of The Lazarus Effects; movies made for purely financial reasons with no apparent love or understanding of the genre. The Other Side of the Door may well be the worst example of its kind so far. This is mainstream studio horror at its lowest ebb - lazy, derivative, inept and xenophobic. Our protagonist, Maria (Sarah Wayne Callies), wakes from a nightmare featuring that most tired of mainstream horror tropes, the screaming kid whose eyes cloud over with X-Files style black oil, their mouth stretching and contorting their face into the subject of a Munch painting (at this point there's probably an app on your phone that will produce this effect). 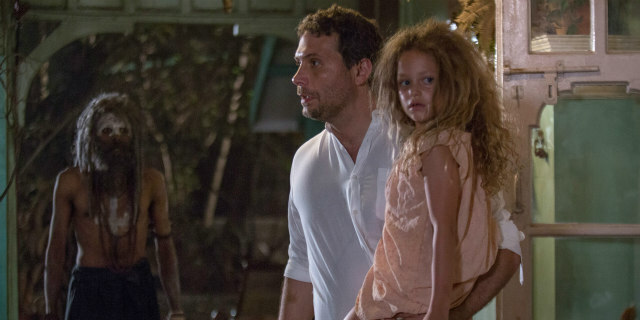 Living in India with her antiques dealer husband Michael (Jeremy Sisto) - who is a classic example of an actor built like a male stripper wearing a cardigan and spectacles to sell his character as a sensitive intellectual - and her young daughter Lucy (Sofia Rosinsky, the worst type of child actor; one who resembles a tyke possessed by an adult rather than an actual child), Maria is struggling to get over the loss of her son in a car accident that resulted in the boy drowning in a river. When Maria attempts an overdose of pills, we flashback to the accident. I may have missed something, but I'm pretty sure this flashback was left hanging for the rest of the movie, which makes no narrative sense. It's never bookended by a return to the aftermath of the suicide attempt, as though everyone involved with the film somehow forgot about this element. Anyway, while recovering in hospital, Maria's Indian housekeeper Piki (Suchitra Pillai-Malik), a character who would no doubt be a Catholic Latin American stereotype were this set in the US, tells the grieving Mum of a way to make contact with her son one more time. Maria must venture to a hidden temple, sprinkle the child's ashes on its steps, lock herself inside and wait for him to contact her. But just as you shouldn't feed a Mogwai after The Late Show, there's a catch here - Maria mustn't open the door, no matter how tempting, or the consequences will be dire. Of course, what does Maria do? To be fair to her, Piki was pretty vague in her instructions; she never told Maria how long to wait before she could open the door. 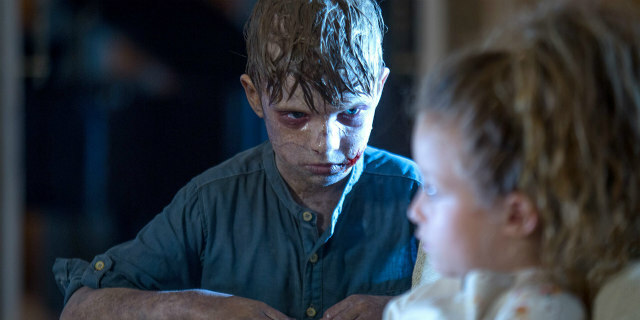 It's obvious early on that The Other Side of the Door is nothing more than a cheap Pet Sematary knock-off, and it's quite open about this, with a dog named Winston in homage to the Stephen King story's undead moggie. The only major difference is the Indian setting, employed here with all the cultural sensitivity of a Rudyard Kipling story (at one point Maria actually reads from The Jungle Book to her dead son). The film assumes its audience shares its xenophobic fear of the other, with a group of ashen-faced tribesmen used here for jump scares that would only work on racists were they not accompanied by the now customary loud bangs on the soundtrack. Sacred Hindu deities are transformed into post J-Horror crawling nasties - try pulling that off with Jesus or Muhammad and see what happens! In terms of narrative storytelling, The Other Side of the Door is a horror show in the worst possible sense. I'll give writer-director Johannes Roberts the benefit of the doubt and assume he was locked out of the editing suite while a bunch of execs hacked his work into a shambling mess of a final cut. Structurally it's all over the place; there's practically no first act! Unlike Pet Sematary, we never get to see Maria's relationship with her son prior to his untimely demise, which removes any poignancy the story could and should have offered; 'sod that', the film suggests, 'let's just get to the jump scares!' As previously mentioned, we have a flashback left hanging with no bookend. The film contains a couple of nods to Poltergeist, while ignoring that gem's lessons in establishing characters and location; when a budgie dies, it comes out of nowhere, as the film never showed us the bird when it was living, and when Maria's garden turns an autumnal brown overnight due to the presence of 'evil', the effect has no impact as the film never bothered to visually convey its previous lushness. The only positive to take from this steaming pile of cynical ineptitude is a competent performance from Callies, which suggests she may have a post Walking Dead career after all, but this role will do her no favours; how can you soar like an eagle when surrounded by turkeys?